The following is correspondence between Clement Bailly [grandson of Jeyhun Hajibeyli, brother of Uzeyir Hajibeyov] in Paris and Betty Blair, Editor of Azerbaijan International, in Los Angeles on August 6, 2001. Here is some information and some sources that I have checked many times, trying to get rid of propaganda or falsifications that surround my grandfather ­ Jeyhun Hajibeyli, who was the brother of Uzeyir Hajibeyov. My own grandfather and my father were "visceral anti-communists". Still today, Azeris are very ambiguous about the Soviet period and it will take a long time before the "truth" comes out. Let historians decide, as we say. So, great grandpa Abdul Hussein Hajibeyli was an Azerbaijani born in Darband, Daghestan. He moved with his wife Shirin to Aghjabadi [in the Karabakh region of Azerbaijan] prior to 1885 as Uzeyir was born there in 1885. Then they moved to Shusha where my grandpa [Jeyhun] was born in 1891 [died in 1962]. Abdul Hussein was a clerk and a village writer, a scribe. Probably a rather wealthy influential person. He loved the arts, music and poetry. Khurshud Banu Natavan, the great poetess, was a good friend as were all the writers including Shusha Hagverdiyev Vazirov, Chamanzaminli, Kocharli (who was not only a scientist, but also a musicologist and painter). The famous tar player Mir Mohsun Navvab, Sadikhjan the new tar "inventor", khanande singers like Mashadi Ichi, Haji Gochi, Jabbar Garyaghdi, Ketchatchi Mammad, Mammad Farzaliyev, Majid Beybudov, Islam Abdullayev and Seyid Shushinsky. 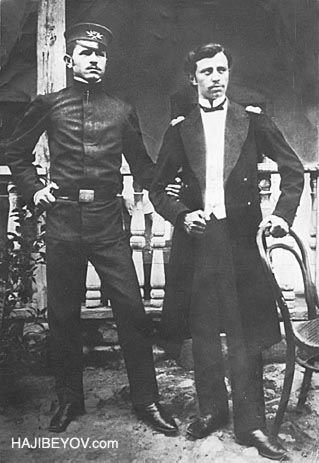 Photo: Jeyhun (left) and Uzeyir Hajibeyov in 1908. The three young brothers grew up surrounded by music and art. Their uncle Aghalarbey Aliverdibeyov gave them music lessons. Uzeyir appeared to be very talented in mugham singing. At the age of 13 he recorded on a phonograph (cb: I'm wondering if they have this document somewhere). The brothers sang together in a boys choral group. They did an interpretation of the song "Majnun at Leyli's Grave". At the same time they were studying at the Russian Tatar school, where there were only two grade levels. Their teacher was the journalist Hashimbey Vazirov. He learned to play violin and saxophone. Jeyhun Bey went to Baku around 1900. In 1908 he went to St Petersburg under the sponsorship of one of the oil barons Murtuz Mukhtarov. He studied law. The "Leyli and Majnun" collaboration occurred between 1905 and 1908. At the end of 1907, rehearsals took place at the Hotel Islamiye in Baku. There weren't many professionals in the orchestra, just mainly friends from Gori - A. Teregulov, A. Gasimov, F. Aghayev. There were problems with the tar players. Two hours before the premiere, Uzeyir had to write new scores for the violins. He had to play the violin himself in the orchestra pit because two tar players did not show up. The conductor was Abdurrahim bey Hagverdiyev, a dramatist. Jeyhun Bey had to play the Ibn Salam role. By the way, his acting received a very good critique in the press. On the first poster which was published on the January 12, 1908, both names appeared - Uzeyir and Jeyhun. Both are mentioned as composers. About "O Olmasun", "Arshin Mal Alan", and "Koroghlu", I am not sure at what level they worked together. My grandfather Jeyhun went to Paris in 1909. He stayed there until 1916, studying at the Sorbonne and Sciences Politiques. This did not leave a lot of time for collaboration on music. In Paris, my grandfather wrote a lot of articles for various French and Azerbaijani newspapers. He wrote one article in France about "Leyli and Majnun" in 1910. After 1916 both brothers (Uzeyir and Jeyhun) were actively involved in the creation of the first republic [Democratic Republic of Azerbaijan which held power May 28, 1918 ­ April 28, 1920]. In 1919 my grandpa [Jeyhun Hajibeyli] again went to Paris with the Azerbaijani delegation [in relation to the Versailles Treaty]. He never was able to return to Azerbaijan from France. Brothers Uzeyir and Zulfugar remained in Azerbaijan. In 1925 grandpa managed with the "Comité France Orient" to give a representation of "Archin Mal Alan" at the Theatre Femina in Paris. He made a translation into French. About the Caucasian Review articles [Institute for the Study of USSR in Munich]. Grandpa was hired by the American government in 1952 along with two other Azeris: and Sheikhulislamov and Fatalibeyli. They were working at the same time for Radio Azadlig (Radio Liberty) based in Munich, Germany. Their goal was anti-communism, press releases and broadcasting. They had written sources from Azerbaijan (Russian Press) through newspapers provided by US government. There are lots of files at the Soros Foundation in Prague as well as Stanford University (Hoover Institution) even recorded tapes from the radio. You certainly can trust your written files as they were written by my grandpa. [bb: He signed many of his articles with the initials DJ G - Russian for for Djeyhun Gadjibeyli which is Jeyhun Hajibeyli in English via Azeri]. Uzeyir certainly had problems with Soviets. People from the Caucasus were considered and still now are viewed as "niggers" by Russians. It is fine if they do music or dance but they shouldn't get too involved with politics. My father tried to talk with the Maestro Niyazi about this period. Nothing came out and the official discourse was totally dumb. My father wrote his impressions in a very long text of what he saw in Azerbaijan during the Soviet period. It was extremely negative and full of anger. I traveled in the 1980s to Eastern Germany, Poland and Czechoslovakia and I cannot forget this ambiance of fear. I recently came across a small book about Uzeyir's life written in 1985. It's a brilliant example of Soviet propaganda. There's not a single word about Grandpa Jeyhun. And Uzeyir was presented as Socialist hero educated by Russian democracy, struggle against bourgeoisie etc. It says he welcomed the establishment of communism ­ all lies. By the way, the name Hajibeyov is quite recent [and reflects the Soviet period]. When my grandpa went to France in 1919, his passport read Gadjibekoff, indicating that the name had already been Russified. The original Azeri name is Hajibeyli.